My, that's a quiet race! A London, UK, man who made his bones on MP3 and Bluetooth accessories has turned his attention, and his millionaire status, toward clean speed – at the Isle of Man. Azhar Hussain, founder of Mavizen, says he wants to see "cutting-edge technology" tested in a top-flight race environment, so that "clean tech is delivered to the consumer faster," he told Wired Magazine. The Isle of Man TT will provide a huge audience for green speed, he said. 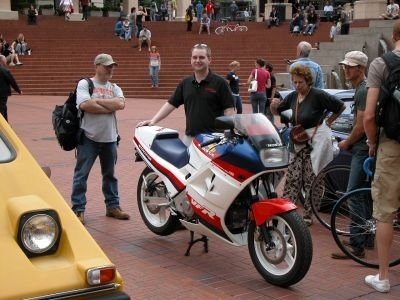 the TTxGP, the world’s first grand prix for zero emissions motorcycles, will be held June 12, 2009. Two classes will be staged, open — with budgets capped at $60,000 — and pro, with no budget limit. Two teams have signed on so far, Kingston University in London, and Electric Motor Sports, from California. The race has been given approval in principle by Isle of Man authorities. Perhaps Oregon resident Travis Gintz will enter his eVFR electric Interceptor. Powered by ordinary lead-acid batteries, the bike will hit 65 mph and run for about 20 miles before needing a recharge. He plans to improve the battery system, and figures he can double the range without much trouble, so if the Isle of Man were run for a single lap, then a pub break, then another lap, then another pub break, he might stand a chance … of finishing a race, anyway. Or maybe not, depending on the amount consumed during pub breaks. Gintz, who has an electrical engineering background, drives a Dodge Durango, and began to consider alternative transport when he saw how fast his money was going into the gas tank. He worked with Portland, Oregon company Synkromotive on the project, and used plenty of donated and scavenged parts to build the eVFR cheaply. Speaking of cheap — the bike will get him to work and home again for about 25 cents.